We are pleased to offer you accommodation available in three different categories and at special conference prices at the TSC 2003 Conference venue. For your accommodation reservation please send us fullfilled TSC Reply Form. 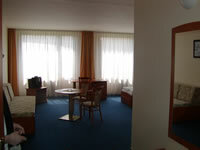 Accommodation is offered in three different types of rooms: standard, executive and apartments. All rooms are equipped with WC/bathroom, direct-dial phone, TV-SAT, mini bar, and hair dryer. Apartments come with Internet access and air-conditioning. Please note that the number of apartments is limited. Buffet breakfast is included and a large number of supplementary services are available. The hotel offers an extended space for relaxation and sport activities. Sports enthusiasts can spend their leisure time playing tennis, table tennis or bowling. TOP HOTEL Praha & Congress Centre has its own casino, fitness/aerobics centre, sauna, solarium, and massage studio. Distance to the city centre: 15 minutes. On your Reply Form please mark your preferred type of accommodation using numbers 1, 2 to indicate your first and second choice preference. After receiving your Reply Form we will send you an electronic (e-mail) hotel voucher for your first choice of accommodation or, in the case of overbooking, we will try to satisfy your second choice. The accommodation payment is comprised of the accommodation deposit, payable together with the registration fee, and the accommodation balance (the difference between your paid deposit and the rest of the costs of your stay), and payable before your arrival. The accommodation balance depends on the number of nights of your stay and the paid accommodation deposit. The accommodation balance will be charged after June 6, 2003 unless you have cancelled the hotel reservation due after that date. Any changes in hotel booking (after the payment of the accommodation balance) will be solved individually.